Beautiful weather, a picnic, and a boat ride - who wouldn't? Clear blue skies, puffy white clouds, spine tingling sunshine, cool, fresh mornings with the smell of dew covered lawns. Autumn in Adelaide is one of the most beautiful times of the year. With the Easter break and the school holidays fast approaching, it's a great opportunity to really experience the simple joys that a day spent in Adelaide can bring, and this is one of my favourite ways to do it. Firstly, head to your local bus stop and catch any bus which is heading into the city. If you're unfamiliar with using public transport, I'd encourage you to give it a try. You'll find that catching the bus allows you to just jump aboard and then relax and gaze out your window until you reach your destination, and you won't have to deal with the stress of finding a car park in the city. It also feels much more touristy, and if travelling with children they'll probably enjoy the big adventure. You can buy a ticket when you get on the bus, they cost $4.90, with discount prices for students, concessions, and anyone travelling between the interpeak hours of 9am and 3pm. Your ticket will cover unlimited usage of all www.adelaidemetro.com.au" id="ccblink" target="_blank" rel="nofollow">Adelaide Metro buses, trains, and trams for 2 hours after the time of purchase. If you're like me and find bus timetables a confusing minefield, then just Google 'Adelaide Metro Journey Planner', enter your address, destination and departure time, and the website will calculate the fastest way there, providing step by step, simple to follow instructions. Print this off, put it in your bag, and you're good to go. Head for the Central Markets (be aware that they're closed on Sunday and Monday each week), located on Gouger St, to the south west of Victoria Square. Browse the 80 stalls filled with the freshest South Australian produce and absorb the colours, aromas and bustling atmosphere of this popular attraction. Buy food for a picnic feast – great items include freshly baked breads, gourmet dips and small goods, fresh fruits, and virtually anything from the sweet shop located bang in the centre of the market. But make sure you can carry everything you buy (taking a picnic basket with you isn't a bad idea). Once you've made your selection, walk to the colourful painted bus stop outside the Market on Gouger Street. Catch the 99C (hard to miss because of its colourful paint job). This is a free bus which comes every 20 minutes and does a circle route around key attractions in the Adelaide CBD, complete with live commentary. Stay on board for while if you're interested in the mini tour, or else get off on North Terrace near Elder Park. There you can find a sunny spot to spread out on the lush green lawns overlooking the river and enjoy your picnic lunch. If you have any bread left over at the end, the resident ducks and swans will happily devour it. Once you've finished your picnic, watch out for the iconic blue and white Popeye boats. Head down when you see one docking (hourly on weekdays, half hourly on weekends and school holidays), and climb aboard. The 40 minute round trip costs $12 per adult and $6 per child (16 and under) or, if you prefer, take the one way cruise to Adelaide Zoo ($8 adults, $4 kids). Take any leftover picnic food to enjoy as you leisurely cruise the Torrens, past the Adelaide Oval, Convention Centre, Festival Theatre, old Adelaide Gaol, the fountain, and the Zoo. It's good fun waving at the people fishing by the river, or else you can just relax, listen to the live commentary, and absorb the beautiful sights and atmosphere. After your cruise, you can spend as little or long as you like relaxing by the river, then walk to the bus stop for your journey back home. For a relaxing way to soak up one of those glorious Autumn days, this is affordable, simple fun, great for all ages. Why? Experience the simple joys that a day in Adelaide can bring. When I was about 11 that would be a favourite Saturday or Sunday. Younger brother, bus to city, art gallery or museum or zoo and botanical gardens and lunch all for $1 each and we were trusted to go by ourselves. Perhaps more accurately, our family trusted Adelaide and its citizens then. But you are right, its the journey; when we smaller we were taken to the zoo but the trip on the Popeye was the highlight. What a wonderful idea! food shopping at the Central Market, and catching the 99C are such ordinary things, but to make a picnic, how lovely. 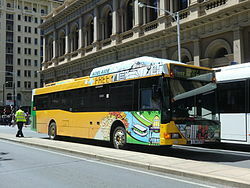 You could also take the 99c to the corner of East and North Tce's and take the picnic to the beautiful Botanic Gardens. Or take a 171 to stop 12 and walk up the hill to the Waite Labryinth.